I recently purchased a GoPro and have been constantly playing around with it and trying to figure it out. I’m not sure if I’m getting older or what, but I don’t feel as tech savvy as I was maybe a few years back. Things don’t seem as intuitive and while playing with these devices, I’m always wondering, “why the heck is this so complicated?” After spending the past two weeks learning how to use the GoPro, I took advantage of the nice weather and daylight savings time to BBQ some chicken and decided to make my first cooking video! This is a momentous milestone for No Limit Cooking because as much as I love writing and sharing my recipes on the blog, I always envisioned myself making some kind of video to visually show people how easy it is to cook. I’m definitively one of those people that learn much quicker seeing than reading. It took me forever to figure out how to use a Video Editor software, but once I figured it out, it wasn’t so bad. There’s still a lot of features to learn! Overall, I’m pretty happy with my first video. There are some things I learned from this experience and hope to improve with future videos. 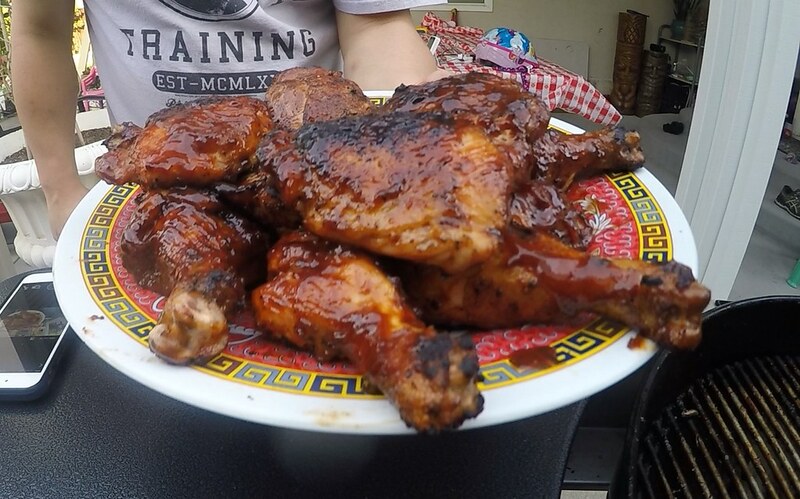 Check out the BBQ Chicken video on my YouTube Channel. Brine Chicken- To make chicken brine, fill a large bowl with 4 cups of warm water. Whisk in salt and sugar until dissolved and add garlic cloves. Add remaining 4 cups of water. Trim excess fat from chicken pieces. Brine for at least 2 hours. Prepare Chicken – Remove chicken from brine and pat dry. Gently coat chicken pieces with olive oil. Liberally season chicken pieces with lemon pepper seasoning. Prepare Grill – Fill a charcoal chimney 3/4 full of Kingsford charcoal briquettes. Light up the chimney until coals are fully burned. Spread hot charcoal over one side of the grill to set up two-zone fire on the grill for indirect grilling. 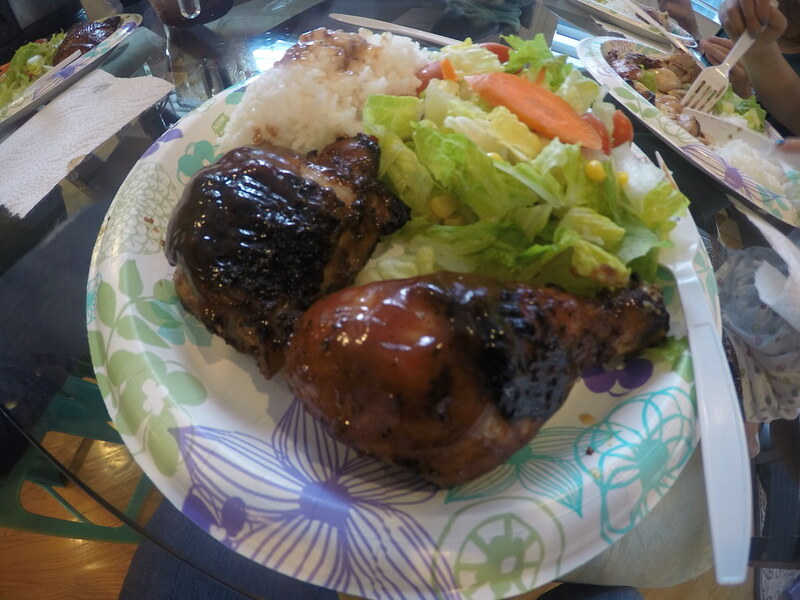 BBQ Chicken – Add chicken pieces skin side up to indirect side of the grill. Cover grill with the lid with vent holes fully opened and over chicken. After 30 minutes, open lid and rotate chicken pieces to ensure even cooking. Close lid. After 45 minutes, open lid and brush both sides of chicken pieces with BBQ sauce. Close lid. Cook for another 15 minutes or until internal temperature of chicken pieces reach 175 degrees. Finish by searing the chicken pieces over direct heat for about 1-2 minutes a side. You can use bone-in chicken breasts as well. For bone-in chicken breasts, make sure internal temperature reaches 165 degrees. Make or use your favorite BBQ sauce. If using store bought BBQ sauce, thin out the sauce a bit by adding 1 tablespoon of water and 1 tablespoon of apple cider vinegar. To add some smoky goodness to your BBQ Chicken, add 2 pieces of wood chunks to the hot charcoal to perfume the chicken with delicate smoke. I used cherry wood. For chicken, a mild and fruity wood like Apple wood and Cherry wood works great.